I've been making this pizza for everyone who comes over. Dropping by for an extended stay? How about some thin-crust pizza? Coming for a little visit? Thin-crust pizza. 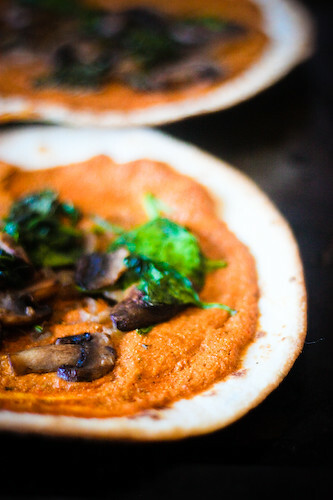 The idea of using a nice Indian flat bread for the crust is such a good one, that you could really just take the idea and run with it. Sausage, cheese, tomato sauce. You know, the classic stuff. But since you're saving all of that time on the crust, you could also put it into this ridiculous sauce. First, you're going to roast your own peppers. You can buy them pre-roasted, of course, but just sticking them under the broiler and turning every 4 minutes or so (depending on your broiler) is a really easy method of roasting. Once the skin is blistered on all sides, put the peppers in a bowl and cover with a towel to give them a chance to steam. This will allow them to cool a bit and will make peeling off the skin easier. Just set them aside in the bowl while you prepare the rest of the pizza. Oh, and about those peppers? They're not going in strips on top. No, no, they're being blended with half of the onions you're about to caramelize, some garlic, some herbs, some vinegar and maybe even some chili. That's your ridiculous sauce. Supposedly this will serve four. More like two if you're not eating them with anything else. And as long as you don't peel off the vegetables (I mean seriously), it's a pretty good complete little meal all by itself. Heat some oil in a skillet over medium and cook the onion until it starts to soften, about 5 minutes. Add the stock, the soy sauce, and the maple syrup. Cook for another 3-5 minutes until the liquid is mostly evaporated. Remove from the heat and set aside to cool a bit while you peel the peppers. Put half the onions, all the roasted peppers, the nuts, 1 clove of garlic, half the basil, oregano, thyme, vinegar and chili into a blender. Season with a pinch of salt and blend until the mixture is smooth. Season to taste with more salt and pepper. In a clean skillet, warm a bit more olive oil over medium, then cook the mushrooms along with a pinch of salt. Stir occasionally until the mushrooms soften, about 3-4 minutes. Add the rest of the garlic (one clove) and cook until fragrant but not browned (about 1 more minute). Add the spinach and cook just until wilted, about half a minute. 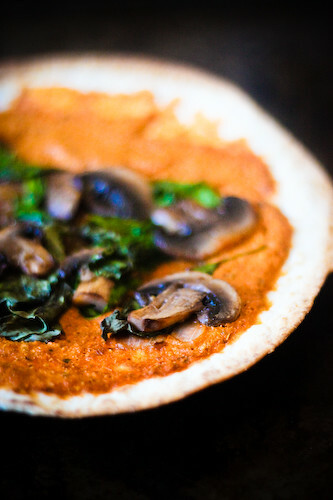 Remove the spinach and mushroom mixture form the heat and fold in the rest of the basil. 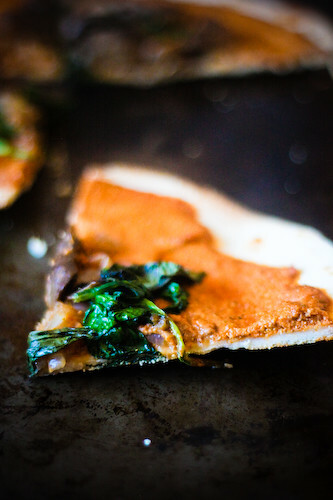 Brush one side of your flatbreads with some oil so they'll really crisp up. Place them oil-side down on a baking sheet and spread the roasted pepper mixture on top. Top with the rest of the caramelized onions, the mushrooms and the spinach. Bake for about 7-10 minutes, depending on the thickness of your flatbread. Remove from the oven and garnish with more fresh basil. Mmm I love pizza and this looks great. Il's look very tasty.. with a little bit pepper. A mouth watering pizzza! Love it!